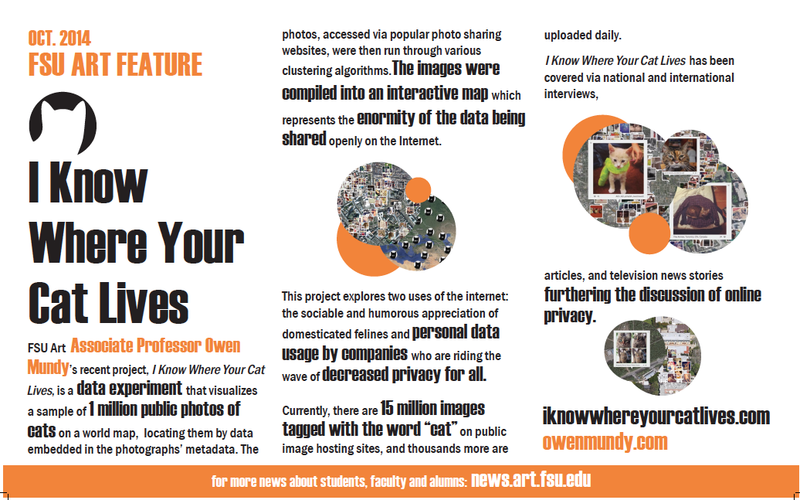 FSU Art Associate Professor Owen Mundy‘s recent project, I Know Where Your Cat Lives, is a data experiment that visualizes a sample of 1 million public photos of cats on a world map, locating them by data embedded in the photograph’s metadata. The photos, accessed via popular photo sharing websites, were then run through various clustering algorithms. The images were compiled into an interactive map which represents the enormity of the data being shared openly on the internet. This project explores two uses of the internet: the sociable and humorous appreciation of domesticated felines and personal data usage by companies who are riding the wave of decreased privacy for all. Currently, there are 15 million images tagged with the word “cat” on a public image hosting site, and thousands more are uploaded daily. I Know Where Your Cat Lives has been covered via national and international interviews, articles, and television news stories furthering the discussion of online privacy.